Posted on May 30, 2015	by Terri B. Note: I completed and posted my week four assignment and final project out of sequence. You will find the final project post below this one. My final project is based on three class sessions embedded in the English Composition (ENG1100) class. I have been included in the teaching of Information Literacy (IL) skills in ENG1100 for a number of years and this instruction has grown and developed over those years. The biggest opportunity to develop this section of the class came recently when the university determined that an introduction to IL skills and concepts would be embedded into this class as part of curriculum development. IL skills and concepts is taught here within the context of the Research Process. The use of educational technology is an important part of teaching IL skills and concepts in this class and its importance ranges anywhere from enhancing the instruction sessions (visual aids) to being highly integral to the learning of IL skills and concepts (hands-on practice). What technologies might be most appropriate for your final project? Does your final project align with any of the trends represented in the Horizon Report you reviewed? Blended learning – My final project includes an online component to the face-to-face class using LibGuides to provide a tutorial with infographics, videos, and brief review quizzes. The guide is used for both self-directed learning, review, and to partially flip the classroom (I do not cover everything in class that appears on the formal quiz administered by the professor of record in ENG1100). This online guide can be accessed by students for review at any time since it is publicly available and not locked down within an online course system. How does your choice of tech enhance or improve instruction or motivate learners? Visuals seem to grab the attention of learners, so I’ve included infographics and short video clips during face-to-face sessions to hook them and keep their attention. Getting students involved in their own learning is highly desirable, so I plan on incorporating a few quick online polls (I’ve successfully used polleverywhere.com before) so students can anonymously self-test. Students want to use their cellphones so why not include these devices as part of the instruction? I already include a brief survey at the end of class for students to self-assess their learning and to provide instructional feedback. Giving students the opportunity to immediately practice the skills and concepts has proven to markedly improve learning, so the hands-on aspect of class sessions is non-negotiable! Providing class time for students to work on their own research the week after the instruction sessions are completed has also resulted in better research and resultant papers. Students have appreciated the safety net of having both a librarian and their instructor available (as well as their peers) as they begin implementing the research process for their own projects. Posted on May 29, 2015	by Terri B. Information Literacy (IL) is considered a core competency by our accrediting body, WASC, and the university is expected to assess students on their competency in this area. IL is addressed throughout the curriculum with an introduction to concepts and skills taking place in a general education course. The English Composition (ENG1100) class has been targeted as the place where students will be introduced to IL concepts and begin to practice IL skills. Most students are required to take this class so it will expose a significant portion of our students to IL. Students are required to research and write many papers at university, so it was agreed upon that the introduction to IL concepts and skills in ENG1100 would focus on the Research Process. The class is taught both face-to-face and online, but this project will focus on the face-to-face format. The IL section of ENG1100 is taught by a librarian during three sequential class sessions (150 minutes total). These three sessions are followed by an additional 1 to 3 class sessions in the library information commons so that students can practice what they have learned by going through the research process in order to complete their class assignment (a paper). I have five learning outcomes for the three class sessions with ENG1100. All five are part of the research process, which is the focus of this instruction. Many of the students in this class are unaware that there is a basic process they can follow for their research assignments and that this will help them avoid a scatter shot approach that generally results in frustration. A few students have experience with the process and I encourage them to treat this as a review and to help and encourage their fellow students. Understand the importance of a well written topic statement. Identify and use appropriate information seeking tools for the topic. Critically evaluate the resources found. Each learning outcome is part of a sequence and assessment is formative. Students are given a topic phrase (video games) and asked to search a library database for three articles that have a similar focus. Students quickly realize that they have too many results and those results are not focused. Some class discussion transpires about the search results. Mostly I’m just looking to see that they are all searching and want to know what to do about the poor search results. Building on the failure to get a focused list of articles, I write a focused topic statement/research question (Are children who play violent video games more prone to violence?) on the whiteboard. Students are asked to identify keywords from this question and write them on a worksheet that will be turned in at the end of class. They are also asked to use an online thesaurus to identify and write down one appropriate synonym for each keyword. I then ask students to help me identify the keywords and I erase extraneous words from the research question on the whiteboard so that we are left with only the keywords/concepts. I then ask them for synonym suggestions for each keyword and write those on the whiteboard. There is a bit of class discussion as we do this and I reward those who make contributions and participate in the discussion with some kind of treat (candy, pens, etc.). I review the worksheets after class and provide written feedback. Students are asked to find a scholarly article using the keywords and/or synonyms identified and are given no guidance about where to look. Some use an internet search engine and some use the library database used in the earlier search for video games. Most students struggle to find a scholarly article either because they use an internet search engine or because they do not limit their database search to scholarly articles and/or don’t know how to recognize a scholarly article. We then discuss their search results, characteristics of a scholarly journal/article, and why scholarly journal articles are important for academic assignments. Next, I demonstrate how I use a library database to quickly find scholarly articles for this topic. Mostly I’m looking for participation at this point. Students are again asked to search for and find one scholarly article to support the research question. They are asked to answer questions on an article evaluation worksheet which I assess after class and on which I provide written feedback. I also provide immediate feedback at this point by circulating while students work and by answering questions at their point of need. Students are asked to include a citation for the article they evaluate on the worksheet in outcome number four. I review and provide feedback on this part of the worksheet. Wrap up: Students take a brief online survey after the last class session giving them the opportunity to self-assess and provide me with feedback. Students also take a 50 point multiple choice quiz the week after the class sessions to test their recall of concepts and skills discussed in class. I use a bit of behavioral (required attendance, assurance that they WILL be required to go through this process repeatedly in future classes, treats for participation), mostly cognitive (chunking and a sequential approach to the content), with a little bit of constructivism (letting students fail at a search and acquire some curiosity about how to be more successful). This course has been extremely helpful in describing instructional design as a process. I have done bits and pieces of the process somewhat intuitively, but have always felt a bit “lost at sea” not really knowing what I was or should be doing to effectively design a class or class session. Learning the names of things has helped my confidence greatly and will allow me to have the verbiage (keywords!) to seek out additional information, further my learning, and keep track of changes in this area. The readings for this class have been EXCELLENT. I did not have time to get to all of the optional (Critical Pedagogy) and supplemental readings, but I have created a bibliography of these readings so that I can work through them in the next month. I have always struggled with using a constructivist approach in my instruction sessions, usually due to lack of time, but I do hope to find creative ways to use this approach more often. I have also struggled with including assessment (again, largely due to lack of time) and hope to get better at including this as well. I don’t believe we have talked about this much, but I learned from Char Booth (Reflective Teaching, Effective Learning) about the importance of reflection on instruction sessions and the teaching/learning that takes place in those sessions. I will continue to include some reflection time as part of the process as well. I must admit that I did not spend enough time looking at peer blogs, but I have marked down a few that I will spend some time looking at now that class is over. I have learned from my peers that we tend to struggle with many of the same things such as lack of class time, desire to use a more constructivist approach (see Chinese proverb below) and include assessment. Posted on May 23, 2015	by Terri B. Discuss which theory/ies might be most applicable to your instruction and outline a specific activity/assignment/exercise that would facilitate learning according to that theory. I tend to use all three learning theories (behaviorism, cognitivism, and constructivism) in my teaching to some degree. I’m drawn to constructivism, but have found it more difficult to implement when dealing with both the professor’s expectations and the short amount of time allotted to meet those expectations. I have mostly resorted to cognitivism with small amounts of behaviorism used to get student participation. I generally start out using a hook such as a graphic or by presenting a scenario that most students can relate too (“Have you ever searched for information on your topic and then found NOTHING? ?”, etc.). Chunking and sequencing is used to structure the lesson to make it easier for students to build on prior understanding and have greater recall. Students are motivated to participate in class discussion by handing out small prizes (candy, pens, sticky notes, etc.). I then give them a focused topic statement/research question such as: “Are students who play video games more prone to violent behavior?” This leads to activities about keywords and synonyms with a resultant search for scholarly articles that is much more successful to the goal of using those articles to write a five page paper. Next, consider what you learned from Small’s article on motivation and address how you are going to motivate your learners/students. There is a fair amount of external motivation built into the course section I am working on for this class project. The professor of record is present and takes roll, students are expected to attend and participate, students are required to do the in class exercises and turn in their worksheets to me for feedback, and there is a 50 point quiz on IL concepts the following week. Students are also expected to use what they learn in the following weeks to research a topic for a short paper. What I try to do is to pique students’ Curiosity and use Flow Theory. Activities are designed to get students to WANT to solve a problem that relates to both their immediate class need (a required paper or presentation) and to future needs (papers and presentations for future classes). The activities are very focused and the goal is clear (i.e. understand why a good topic statement is important and what does one look like, how to identify useful keywords and synonyms, how to use keywords/synonyms in a library database to run a search (AND/OR), how to limit a search to retrieve scholarly articles, etc.). Students work on these activities in class and submit their worksheets to me for feedback. I explain to them that these worksheets are a safe space to practice their research skills since I do not assign a grade but I DO provide extensive feedback because I want them to succeed; that these skills are only learned through practice and this is their chance to practice. Posted on May 17, 2015	by Terri B. Limited time (150 minutes class time) – IL instruction embedded in the English Composition class is focused on the main points of the research process. Application goals include the importance of a focused topic statement, identification of keywords and synonyms, where and how to search for scholarly journal articles, critical evaluation of search results, and the citation of sources. Connection to institutional general education requirements – Initial introduction to IL concepts and skills is connected to the general education curriculum. The institution has determined that IL introduction should take place in a required course early in a student’s college coursework and that it should address concepts and skills students will use throughout the college career. The research process as presented in the application goals will be used repeatedly by students at this institution. Extrinsic motivation – Students in a required course, which is taken early in the college career, tend to need extrinsic motivation, practice, feedback, and much encouragement. The IL section in this class provides students the opportunity to practice the research process in class. They receive encouraging feedback through class discussions and worksheets completed during class. Extrinsic motivation is provided by requiring students to use the research process to complete an assigned paper for the course, and by passing a graded quiz focused on IL concepts and skills. There is always some disconnect between the characteristics of the learners and the teacher. Many first year students don’t know what they don’t know and need to be persuaded that learning IL skills and concepts will benefit them both in the near and long term. Feedback and assessment is provided for each of the application goals. Immediate feedback is provided through class discussions, practice, and some of the worksheet activities completed in class. Worksheets are collected and additional in-depth feedback is provided in writing; the worksheets with written feedback are returned at the next class session. Feedback on the worksheets is intended to empower and encourage the student to assess their own performance. Individual assessment is derived from the worksheet results, IL quiz results (graded), and the quality of resources used in the assigned paper. Anecdotal assessment is gathered through class discussions. The teaching/learning activities effectively support all of the learning goals. The application goals have learning activities attached to each goal. The foundational knowledge, integration goals, and human dimension and caring goals are mainly supported through the lecture and discussion components. I have been refining this IL session for many years and have, over the years, focused the goals and discarded extraneous activities that do not serve those goals; I’m not sure if there is anything left to discard, but I will continue to reflect on this aspect! The practice learning activities and the associated feedback opportunities do prepare students for the assessment activities, but I have not previously provided students with written criteria and standards for successful completion of a goal. I have provided this verbally as we address each goal, but I think students would benefit from a more intentional explanation on my part. Not sure how to assess their understanding; need to think about this more. Look at keywords and synonyms written on their worksheet. Look at research database choice written on their worksheet. Look at answers to critical evaluation questions written on their worksheet. Look at citation of article written on their worksheet. Present students with two topic statements, one vague and broad and the other specific and focused. Demonstrate a database search using each topic statement and discuss the results (many and low relevance vs. fewer and more relevant). Ask students to identify and write the keywords (main concepts) from the more focused topic statement on their worksheet. Ask students to help me identify the keywords by telling me which words to erase from the focused topic statement which I have written on the whiteboard. Discussion. Ask students to use an online thesaurus and identify and write one synonym for each keyword on their worksheet. Ask students to tell me synonyms to write under each keyword on the whiteboard. Discussion. Show students how to navigate to the library home page and then to the research database by subject list; ask them to follow along on their computer. Ask students to choose a research database they think would be appropriate for the topic and write it on their worksheet. Discussion. Students all navigate to the same database that was chosen based on discussion. Show students how to enter keywords into the database using the Boolean connectors AND and OR. Discuss variations. Students all enter the same search sentence that was chosen based on discussion and then click the search button. Students choose an article from the search results list and answer critical evaluation questions on their worksheet. At the end they provide a self-assessment of the appropriateness of their article choice. Students cite the chosen article on the evaluation worksheet (see #4). Online course guide designed specifically for this IL session (LibGuide). Students are encouraged to come to my office or make an appointment for research assistance at any time. They are also encouraged to get research assistance from other librarians as well. Posted on May 16, 2015	by Terri B. 1. Forward-Looking Assessment Formulate one or two ideas for forward-looking assessment. Identify a situation in which students are likely to use what they have learned, and try to replicate that situation with a question, problem, or issue. Situation: Students must write a research paper. They have already developed and written a topic statement/research question and now need to identify the keywords (main concepts) in the topic statement/research question and select appropriate synonyms for those keywords so that they can successfully search a library research database and find a relevant scholarly article. Question: What keywords are in your topic statement/research question that represent your main ideas/concepts? What other keywords might you use (synonyms) to describe those main ideas/concepts? 2. Criteria & Standards Select one of your main learning goals, and identify at least two criteria that would distinguish exceptional achievement from poor performance. Then write two or three levels of standards for each of these criteria. Main learning goal: Identify keywords and synonyms in the topic statement/research question. Criteria One: Students will identify all keywords that represent the main ideas/concepts in the topic statement/research question. Criteria Two: Students will select appropriate synonyms for those keywords that might also represent the main ideas/concepts. 3. Self-Assessment What opportunities can you create for students to engage in self-assessment of their performance? Opportunities: Class discussion will take place after students have identified keywords and again after they have identified synonyms on a worksheet. Students will identify keywords from the topic statement and write them on a worksheet provided to them. I will write the topic statement on a whiteboard and students will advise which words I should erase from the topic statement, thereby leaving only the keywords/phrases that represent the main ideas. Discussion will take place about the inclusion or exclusion of words in the topic statement. Further discussion can take place to suggest the use of filters (limits) for those parts of the topic statement that are not keywords but are nonetheless important to the search (i.e. dates, etc.). Students will use an online thesaurus to identify synonyms for the keywords and write them on a worksheet provided to them. I will write keywords/phrases on a whiteboard and students will advise synonyms to be written under each keyword/phrase. Discussion will take place about the choice of synonyms and why they will or will not work. Demonstrations using those keywords and synonyms to actually search a database will be done in order to provide discussion about the success or failure of using chosen terminology. Frequent – A worksheet and discussion will be provided for each of the main learning goals. Immediate – Class discussion will provide some immediate feedback and worksheets will be returned at the next class session with constructive feedback. Discriminating – Students will be given the criteria and standards for successful completion of a goal. Lovingly delivered – In class discussions I try to use words like “good,” and if a student is not quite on the right track I use leading questions to try and get them to provide an appropriate response. I encourage them to be bold and show me their thinking on the worksheets since I will be providing feedback without a grade – I explain to them that this is a safe opportunity to practice their research and evaluation skills! I also use encouraging words, suggestions, and smiley faces on the worksheets. Posted on May 9, 2015	by Terri B.
ENG1100 is an English Composition class with an Information Literacy (IL) unit. The focus of the IL unit is the Research Process. The class can have up to 25 students and is taught by both full-time and adjunct professors in the English Department. The Information Literacy unit is taught by me and is 150 minutes (50 minutes 3x or 75 minutes 2x) total in a computer classroom that I schedule once I know which week the IL instruction will take place. An additional 1 to 3 sessions take place in the library information commons the week following IL instruction so that students can do research for their class assignment (a paper) while both the professor of record and the librarian are available to assist. The English Department is part of the College of Arts & Sciences (CAS) and the ENG1100 course is part of the general education (GE) requirements. Most students take ENG1100, but a few test out and some transfer students have taken the course elsewhere. Our accreditation body, WASC, expects the university to address IL as one of the five core competencies. The CAS expects students to be introduced to IL concepts and begin practicing IL skills in the ENG1100 course. The focus and context for this introduction is the Research Process – scholarship as a conversation and research as a process. IL as taught in ENG1100 is both theoretical and practical. Students are introduced to ideas, concepts, and metaphors to help them understand academic scholarship, what is expected of them as scholars, and what IL means in the context of academia. Students are then walked through the basic research process and taught practical skills that they practice using worksheets designed for the IL unit. IL is both convergent and divergent since particular skills need to be learned and practiced, but it transcends skills and resources. We hope to move students from rote skills to concepts that will allow them to adapt those skills to future needs. Most students in ENG1100 are between the ages of 18-22 and are in their first year of university coursework. Extrinsic motivation is still the main motivating factor for students in this class; very few come into the IL instruction and practice sessions wanting to learn what is taught. These students do tend to respond to a tie-in to the assignment, interesting hands on practice, group work, and an in context reason why they should learn what is taught. I believe that students need to know that what I teach them will benefit them in both immediate and future ways. Tying the IL instruction to an assignment, providing hands-on practice, using visual aids (infographics, etc. ), and making the instruction interactive between myself, the professor of record, and the students makes them participants in the teaching/learning experience. Hopefully they will begin to see how IL is relevant to their own lives as students, citizens, and future professionals. A year or more after this course is over, I want and hope that students will be confident in their ability to find and evaluate information in various contexts and for various needs. Information seeking skills learned in this class can be adapted and used in other classes and for needs outside of the academic realm. Critical thinking and evaluation skills are always useful and appropriate no matter the situation or context. Proper and ethical use of information is always appropriate. You can do this! Students can learn to search multiple and complex systems. Trial and error, people! There is not one perfect or correct search. You are not alone! Research takes time and others struggle with and “work” the process too. Take advantage of the opportunity to practice during class time and get useful feedback on your practice worksheets; these are not assigned a grade and it is a safe space to explore and practice search skills and critical evaluation. Think about and develop a search plan. Strategic searching will save time and frustration. Accept the invitation to use the librarian as a human resource for research help in this class, other classes, and whenever you need information assistance. I see many lost and confused students in my role as a reference and instruction librarian. According to a study done and reported on by Project Information Literacy, 84% of students find that the most difficult part of the process is getting started. New students in particular are surprised by the length of time it takes to properly research a topic and I’m always looking for ways to help these students understand that this is normal. I recently created the following infographic to use at my university and have had positive feedback from students and faculty alike. Students really respond to the visual impact of infographics. 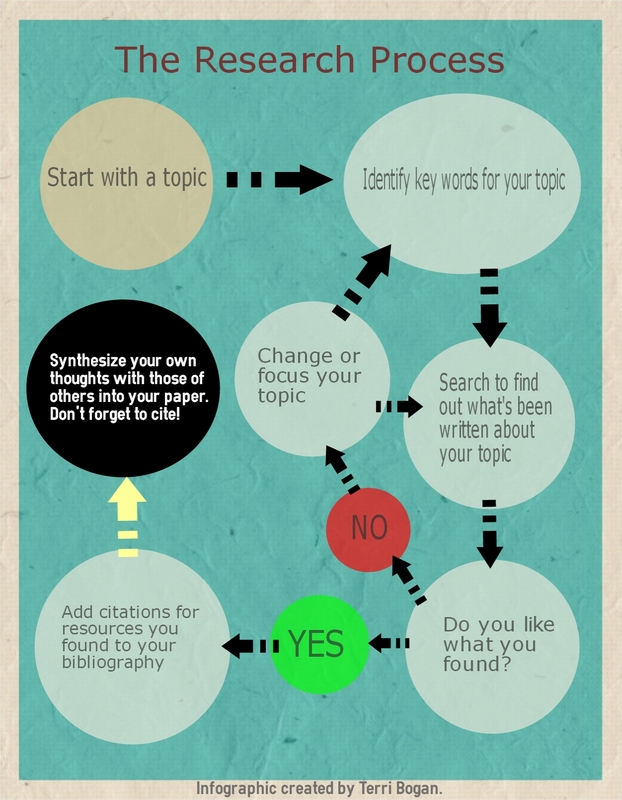 Do you use infographics in your teaching or library? The Research Process by Terri Bogan is licensed under a Creative Commons Attribution-NonCommercial-ShareAlike 4.0 International License.